~* West End Designs Journal *~: YUM...Snacks! Happy Monday! Yesterday was my birthday so I made some fancy cupcakes! It was my first attempt (and certainly not my last!) at making gum drop flowers! Aren't they cute? They remind me of Mary Englebright!! I plan on doing a tutorial for these for our food blog: Radish Roses. And I made myself awesome appetizers! I could make a meal of just little snacks!! 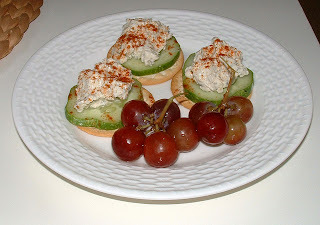 This is Blue Cheese Dip on sesame water crackers with cucumber! YUMMY!! I also made Pan Fried Onion Dip....but it doesn't photograph very well. The recipe is here and you MUST try it. So very worth the time! !Trust me it is DELICIOUS!!! Oh! 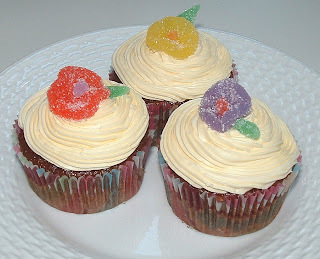 I LOVE those gumdrop flowers!! So pretty! That onion dip sounds amazing too! Mmm! Yes, please to both of the nibbly bits. Where's that darn pneumatic tube when you need it? ?